NIA CHARLESTOWN NEVIS (October 09, 2014) — Premier of Nevis Hon. Vance Amory thanked Prime Minister of St. Kitts and Nevis Rt. Hon. Dr. Denzil Douglas for accepting an invitation from the Nevis Island Administration (NIA) to tour ongoing works for the Caribbean Development Bank (CDB)-funded Nevis Water Supply Enhancement Project on October 08, 2014. Mr. Amory’s comments came while he and Junior Minister in the Ministry of Communications and Works Hon. Troy Liburd led the Prime Minister on the tour of the project. He described the project which has received additional funding through the Sugar Industry Diversification Foundation (SIDF) as an important one to the people of Nevis. “I believe that all the people of Nevis will be very happy when this project is completed. Minister Liburd tells me, it should last some 18 months in the hope that we will not have any significant time delays but it is an important project, Prime Minister and as we often say, development in Nevis will have positive effects on the development in St. Kitts and vice versa and so, I want to thank you for coming today and to view what is happening already with this project,” he said. 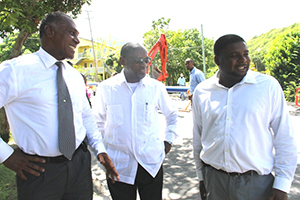 According to Premier Amory, the project was critical for the people of Nevis and private sector projects in various parts of the island. “We are also looking at the Liburd Hill Project which should be on stream, the ground breaking in November here in the St. James area and there are so many others on the other side of the island. 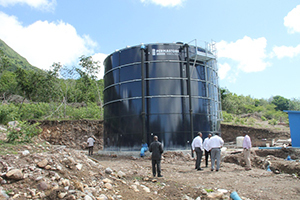 So this water project is very critical to the future development of Nevis for the use of the people,” he said. Mr. Amory used the opportunity to thank the Chief Executive Officer of the SIDF Terrence Crossman who was also present, and whom he said had made the funding possible. He also thanked Junior Minister Hon. Troy Liburd, under whose portfolio the project fell, for organising the tour.